van Vleck, J. H. - Component of : Early Ideas in the History of Quantum Chemistry. 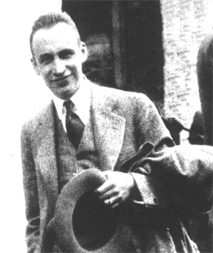 John Hasbrouck Van Vleck, 1899–1980, American Physicist, born in Middletown, Connecticut, USA. Educated entirely in the USA, he taught at Harvard (1922-23) and the University of Minnesota (1923-28), where, in 1926, he expanded English physicist Paul Dirac's quantum mechanics to explain the electric and magnetic properties of atoms. His classical treatise, The Theory of Electric and Magnetic Susceptibilities (1932), published while he was teaching at the University of Wisconsin (1928-34), earned Van Vleck the title "father of modern magnetism". He promoted the union of physics and chemistry, applying his discoveries to chemical bonding in crystals. Returning to Harvard (1934-69), he used his theory in studies of nuclear magnetic resonance and in the development of computer memory systems. He shared the 1977 Nobel Prize in physics (with Philip Anderson and Nevill Mott) for his pioneering research. His colleagues knew him as a patient, gentle man whose personal interests included collecting detailed information of US and European railroad timetables. Reference: This nice and informative text was taken from here. At the Nobel Foundation one may find van Vleck's complete autobiography. Photography at left © J. Chem. Ed. 56, 296 (1979). Van Vleck played an important role in the development of Crystal Field Theory. History of the Crystal Field Approach. in : Introduction to Ligand Field Theory. Copyright © Apr. 18, 2002 by U. Anders, Ph.D.